Several years ago we traveled to Boston and then to New York. When my friend at work, Tammye, learned we were going to New York, her favorite city, she insisted we use her GPS. I told her, “No, we won’t need that, we have an atlas and maps!” Being a geek, I love reading and using maps (I even love folding maps) and I have always loved being the “navigator” on the road trips. We took the electronic device, which was surprising simple to use considering the complex technology it utilizes. The British sounding voice from the little box told us each turn to make along our way as the screen depicted our little red car on the map moving along as we traveled. As it turned out, it was my turn to drive when we reached New York City on our way to Boston. I gripped the wheel tighter and kept my eye almost as much on “Daphne”, the nickname we gave to the voice on the GPS, as on the road ahead. I didn’t think about where to go, I only turned where she told me to turn and went straight where she told me to go straight. When we finally passed out of the city, I almost had to pry my fingers off the steering wheel. The GPS had proven itself to be an invaluable tool. Earlier this month, my boss resigned. As her assistant, many in our department have felt it would be the logical choice for me to step into her position. My friend Tammye especially has been pressuring me to take the position. I told her, as I told others, I did not desire the position, but I would pray to seek the Lord’s will for my life in this matter. I laughed at her and responded, “Well, He didn’t tell me that. If He does, I’ll let you know.” I did however reiterate my promise to continue praying about the matter. Tammye was relentless, every time I saw her, trying to convince me. I knew the main thing in the decision was not what I wanted, or what Glen wanted, or even what Tammye wanted. It was what the Lord wanted. That was the piece of information I wanted to know. I wanted His path to be plain to me. One afternoon it became so. I had worked the night before, and has had been for several days, with the thoughts of the unit weighing heavily on my mind, I had not slept well. I woke with a remembrance of our trip to New York. As I was driving, we entered a tunnel and shortly after entering the tunnel, our GPS lost it’s signal. Suddenly there was no “Daphne” to tell me what to do. I wasn’t too concerned at that point though, because how much can there be to do in a tunnel? Now driving in the tunnels in New York is not like driving in the tunnel here at home. The people there drive 100 mph when they are taking a Sunday cruise and the lanes are narrow. Suddenly, the lanes diverged. I didn’t know which way to go. . .our GPS screen was still grey. Slowing down was NOT an option; I had to respond and do so quickly. I decided it didn’t make sense for us to change lanes at that point; I should just stay on the course I was on – not move to the right or the left. It turned out to be the perfect decision. Soon our GPS reconnected with the satellite showing we were on the proper course for Boston. Immediately upon remembering this incident, I knew the Lord was making His way plain before my face and using a memory of Tammye’s GPS to do so. I was to stay my course, not to make a change to the right or to the left until He told me otherwise. When I shared the story with Tammye, she agreed, although perhaps relunctantly. We face so many times in our lives when we don’t exactly know what to do. The answer isn’t clearly spelled out in Scriptures and we just aren’t sure what step the Lord would have us to make. If our heart’s desire is to follow Him and His will, then He will make that way clear for us. Instead of a GPS – global positioning system, we can trust we will have GPS – God positioning system. He will show us His path, strengthen and enable us to walk in it by faith and then walk with us every step of the way. His batteries never fail, His maps never need to be updated, His way and knowledge are perfect. New Old Shoes or Old New Shoes? My daughter Emmie and I can wear the same shoes. But we don't. Everyone who knows me knows I love a beautiful pair of shoes -- I guess I get that from my mother --and Emmie has a few pair that I would love to wear. However, I have respected her closet and kept my hands off of it. Or I guess kept my feet out of it, I should say. She has shown me the same courtesy. A few years ago Emmie bought a cute pair of brown heels that I loved. I asked if I could try them on and I was given a stern warning not to "stretch out" her shoes. I never even put a toe in the shoes, but every time I saw them on her I admired them. A lot. I looked all over town for a very similar pair to no avail. Finally, I just gave up or perhaps I was distracted by some other beautiful shoes I found instead. The point is, I forgot about her brown heels. Until the other day. I was busy working on a project in the living room and she was busy cleaning out her closet. She walked in and set not one, but two pairs of brown heels beside me and asked, "Do you want these?" One was the very pair I had admired for quite some time. She had grown tired of them, and her desire for more space was greater than her desire for the old shoes. I was thrilled to have them, but not sure they would actually fit. I tried them on and they fit like silk. Her months of wearing them had softened the leather to the point they were more comfortable than almost any in my own closet. I gladly took both pairs. So did I have a new pair of old shoes, or an old pair of new shoes? It doesn't really matter, I was thrilled because I had the shoes I had wanted for quite a while. My desire had not been lacking, nor had my ability to purchase the shoes. It's just the shoes weren't ready for me yet. Sometimes that is how it works with things in our lives. We have a desire for something, maybe we even have the gifts or talent for it, but it just doesn't seem to be forthcoming in our lives. Perhaps we look and look for it, as I did for a similar pair of shoes. But all along the shoes were right here in my house being broken in for me by someone else. Sometimes we just have to trust that the Lord's timing is not only right, it is perfect. He is God and we are not. His way is perfect and ours is not. When we let our heart's desire be to follow Him and have Him work out His eternal purpose in Christ Jesus in and through us, then we will see the desires of our heart fulfilled in ways we could have never imagined. Today we are celebrating an anniversary at the assisted living facility and nursing home where we do services each week. We are beginning our tenth year there. What a joy it has been to fellowship with the residents, to get to know them and to have them as friends, and worship with them! As I think about this anniversary it makes me think that there are many different types of anniversaries, the birthday being the most common. Perhaps the wedding anniversary is the second most common. 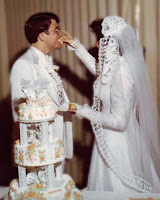 My husband and I have been married for thirty-three years, but this past January we celebrated our thirty-fifth anniversary. We were married on December 30th and it was a wonderful time to be married. All month long I received deliveries of packages decorated in white paper and white ribbon – it was as if Christmas day was all month long. On the 25th we had a nice Christmas, the last one I celebrated in my parent’s home, and five days later we were married. The church was especially beautiful, still being decorated for Christmas. We had taken special time choosing our wedding cake for that day, it was important to us that it taste as good as it looked. As most newlyweds do, we reserved the top of it to eat on our anniversary. That day was never to come. Oh, our anniversary came, right on time. But we didn’t have the joy of sharing that delicious cake with our family on our special day. You see, three and a half months before, a terrible visitor tore into our city. 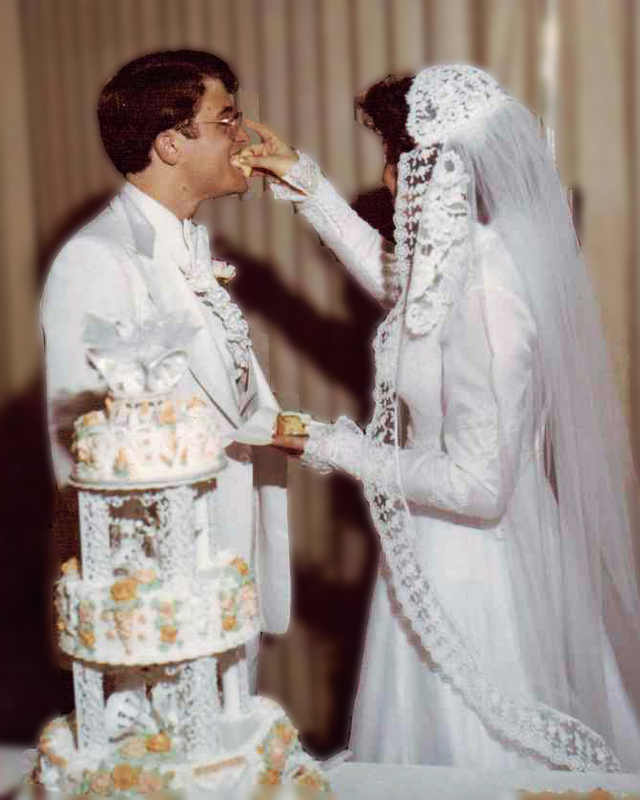 On September 12, 1979, Hurricane Frederic devastated our town and the resulting loss of electrical power for two weeks destroyed our wedding cake in my mother’s freezer. We did have a cake that day, though. My husband's cousin kindly went to the bakery and bought us a cake with wedding bells on it so we would have one to share on our anniversary. We weren’t able to celebrate much on our second anniversary either, since nine days before I had given birth to our first child. These two years seemed to set the pattern for our anniversary being not much of a day for celebration. Once the children came there just didn’t seem to be much revenue left after Christmas for anniversaries. So we began the tradition of celebrating our anniversary on another anniversary. On January 23, 1977, two friends sat across a table talking. One reached across the table and took her hand in his and she forever fell into his heart. We celebrate that day thirty-five years ago instead of the one we never seem to be able to celebrate. We have made a substitution. Sometimes in our lives, the Lord closes a door. He makes it appear as if we can’t have or do or be something we really wanted in our lives. But He never leaves us without hope. As the old saying goes, “If the Lord closes a door, He will open a window.” And the marvelous Southern windows down here are so tall; you can step right through them out onto the porch. Sometimes we just have to be willing to do so – to accept the substitution. Sometimes we have to ask the Lord to give us eyes to see that substitute, or to let us see the right day circled on the calendar.